Knives come in all shapes and sizes, but for many of the purposes for which an undercover operative might need one, small is preferred; hence, the plethora of diminutive edge weapons available to persons working covert operations for a well-supplied organization such as the Central Intelligence Agency (CIA). Knives may be used for escape and related applications such as lock-picking, or—more infamously—to inflict personal harm. For the latter application, where assassination is the intent, concealment is key, and small daggers (a smaller instrument, made purely for stabbing) are favored. Other knives are made for close combat, in which case a longer blade offers an advantage. A butterfly knife carried by German pilots in World War II helped downed pilots and paratroopers cut through parachute lines. rotate outward. It is too blunt to be used for inflicting bodily harm, but can be useful in escape. The inside of the blade is much sharper, after the manner of a cigar cutter, and was sometimes used to slice through the tire stems on German vehicles during the war. The British favored their one-pence piece, though any large coin would serve the purpose. A similar concept is the ring knife, whose blade is much sharper than that of the coin knife, and not retractable. To conceal its purpose, users hide the curved blade on the inside of the hand until it is needed, at which point the ring can be turned around and used. 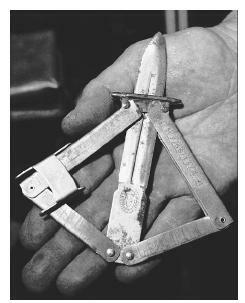 Lapel daggers, also used widely by the Allies and Resistance in World War II, resemble thumb knives. (The latter are discussed elsewhere, in the context of assassination weapons.) Very sharp and short, the lapel dagger often had a hole at one end, through which passed a loop to attach it to the forefinger so as to ensure greater control when using it. Originally these weapons really were concealed in lapels, but after the Germans became aware of this practice, agents found other places to hide them, including in the lining of their clothes. Some hid them in their socks after the style of the kilted Scottish warriors, whose shen du had been the model for the lapel dagger. Long knives for power. Knives and daggers have been concealed in belts (that is, on the inside of the belt and parallel to it), in belt buckles, and even in the plastic arms of eyeglasses. But when the user is going into a situation of open combat, and concealment is not necessary, a large knife is desirable. An example is the throwing knife, which looks like an elongated spear point (though with the flanges rounded off) along with about six inches of the "spear" itself as a grip. It is very thin, which makes it easy to throw, but in order to be effective, it must be thrown with both accuracy and power, and throwing must be followed by one or more thrusts at close quarters. Most formidable-looking of all is the Fairbairn-Sykes fighting knife, developed in World War II by two British officers, W. E. Fairbairn and E. A. Sykes. Based on knowledge gained from their experience in close combat while serving with the Shanghai police, the knife would quickly dispatch a victim by striking at his vital organs. Its blade was long, but the handle was nearly as lengthy, so as to ensure great control on the part of the user. First produced in 1941, it was readily adopted by the Allies. British commandoes carried it on raids into Norway, and the United States Office of Strategic Services (OSS), which employed Fairbairn as an instructor, developed its own version. Revised over the years, the knife remained in production through the 1990s. De Riaz, Yvan A. The Book of Knives. New York: Crown, 1981. Stephens, Frederick John, and Michael Boxall. Fighting Knives: An Illustrated Guide to Fighting Knives and Military Survival Weapons of the World. New York: Arco, 1980.